Do you know anyone who has had a hip replaced? Were they “jumping” for joy in excitement about it? Probably not. Very soon, however, you can thank FHN Foundation endowment donors for the purchase of a state-of-the-art surgical table that can mean faster recovery for our hip replacement patients. Each year, the FHN Foundation Board of Trustees determines the best use of our prior-year endowment income. This year, the board decided to use the funds to buy FHN's orthopaedic surgeons a hightech surgical table to facilitate anterior hip replacement surgery. The Hana orthopaedic table allows precise control of patient positioning, manipulation, and traction during minimally invasive hip replacement surgery and provides better access to the hip joint for improved alignment and positioning of the implant. This can mean less damage to major muscles and a Hana Table Means Faster Recovery for Hip Replacement Patients faster recovery for those who need this surgery. Thank you to all those who have supported the FHN Foundation endowment. Can't wait to see what you buy next year! 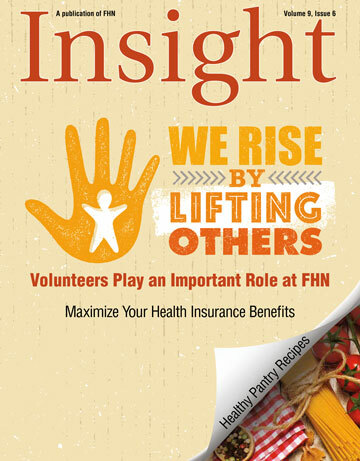 The Hana® orthopaedic table is featured in Insight magazine. on the Dial-A-Doc radio show.